British heavy metal legends, SAXON, are to release The Solid Book of Rock, on August 4, 2017. The set comprises not only all 9 of Saxon's studio albums from 1991 to 2009 BUT eight bonus tracks AND two bonus CDs – "Classics Re-Recorded" originally issued with the initial pressings of "Killing Ground", and "Lionheart – rough studio mix" originally issued on the 2006 limited edition. 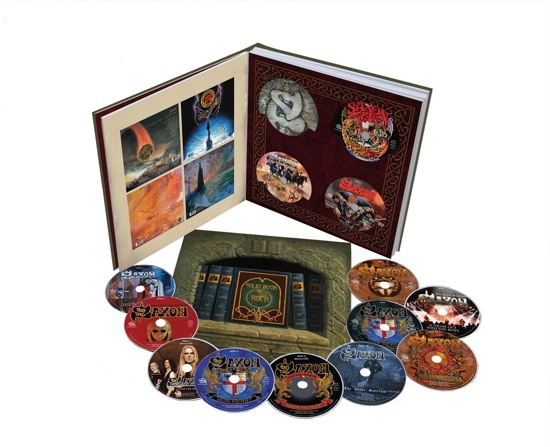 This metal-tastic Book Set also contains three bonus DVDs – the limited-edition DVDs originally released with "Lionheart", "The Inner Sanctum" and "Into The Labyrinth". All this, packaged in a sumptuous 24 page 12" x 12" booklet with all the lyrics and credits, plus photos with fabulous brand-new cover painting by Paul R. Gregory. Saxon frontman Biff Byford says: "It's worth getting just for the art work A great piece of Saxon history and don't forget I get to play King Arthur I didn't get the Oscar that year or anything else for that matter...."
Saxon released their self-titled debut in 1979, followed by the classic "Wheels of Steel" the following year, which catapulted the band to fame and reaching #5 in the UK charts and containing the still popular title track and "747". They established themselves as one of the icons of the New Wave Of British Heavy Metal throughout the 80s. Later the band tried to attack the US market taking a more melodic direction with release of "Destiny" in 1988, before going back to their original sound with 1991's "Solid Balls of Rock", reaffirming their influence on the European metal scene. They continued touring and recording enjoying continued success.